On Monday night, September 11, 2017, Beth Mowins made history by becoming the first woman to call a nationally televised NFL football game. Although a highly praised achievement for women in sports, twitter users had a lot to say about a woman invading a male dominated space for the days that followed. On a global scale, as expected, 91.5% of Twitter users who were tweeting about “#BethMowins” were in the U.S, where the NFL is based. 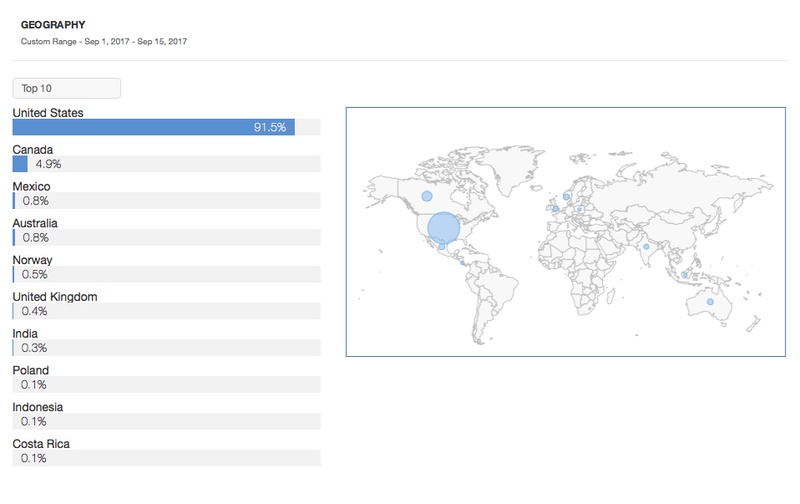 Some other users were tweeting from locations like Canada, Brazil, and the U.K. for example. 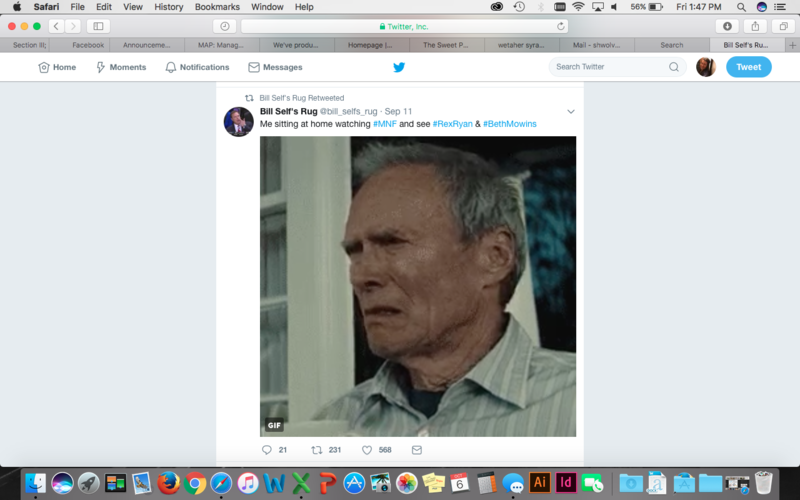 Many Twitter accounts acknowledged the fact that Mowins was making history, but other accounts joked that Mowins was part of the reason a “mute button was created.” The most retweeted tweet featured a disgusted gif of Clint Eastwood. Users also didn’t know how to feel about hearing a woman’s voice call an NFL game; leading us to believe users still, in 2017, have mixed feelings about gender and sports. 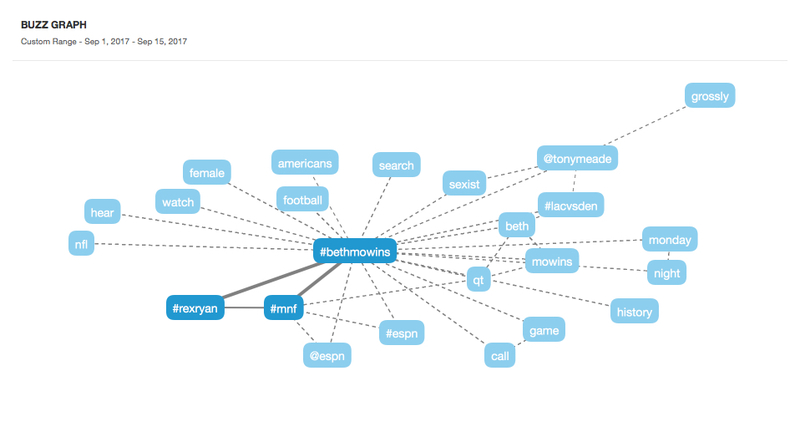 With a total of 1,265 mentions of “#bethmowins” and 13.9K total mentions of “Beth Mowins,” the most prominent spike in mentions occurred on September 11th, during the game she commentated, and began decreasing rapidly beginning on the 12th. 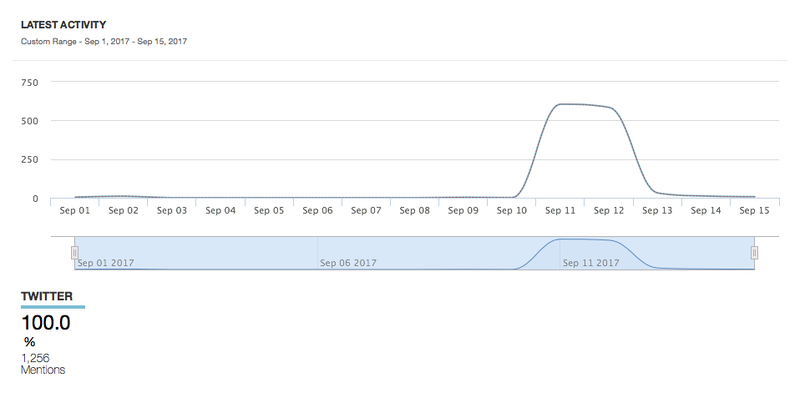 By the 14th of September, the mentions were back to around zero, as they had been before the 10th. Clearly there was some controversy and praise around the topic for a few days before and after the event. 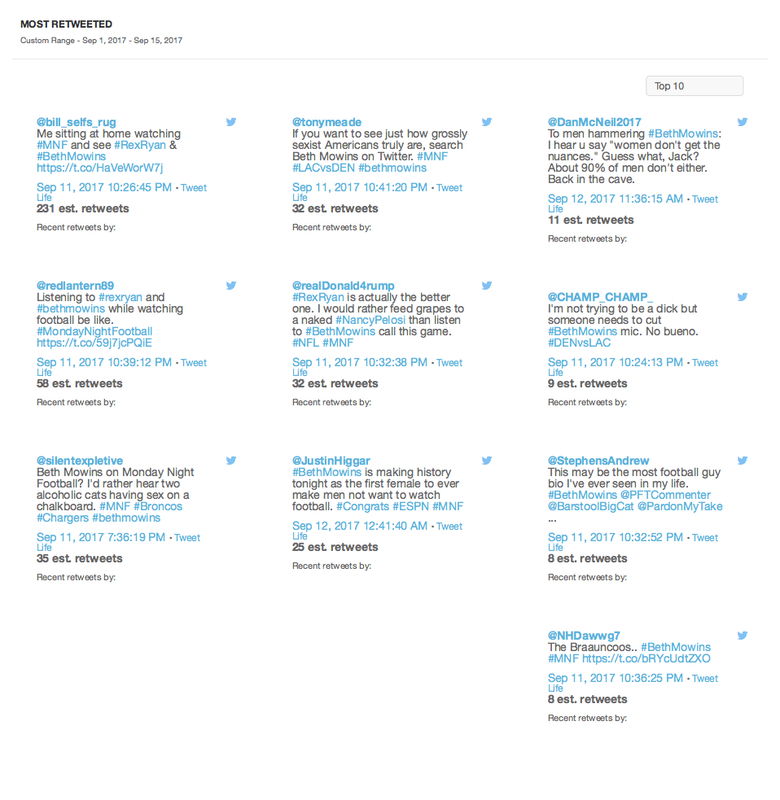 The buzz graph generated for this topic yielded mostly positive or neutral commentary connected to the Mowins hashtag. Words like “grossly” and “sexist” are alarming, but could be used in Mowins’ favor for reprimanding naysayers. While the most retweeted tweet wasn’t too kind, the word cloud Sysomos generated was a bit better. “Worst voice” and “awful” are present, but very small. What takes up most of the cloud are statements of fact and positive statements like “Monday night football” and “great job,” which says that positive sentiment outweighed the negative critics, for this metric. Overall, sentiment seemed to be positive on Mowins’ place as the first female to call a nationally televised NFL event, though with several reservations on the quality of her voice and commentary. Wow, I had no idea that this even happened! This is really interesting- especially given all of the things happening in the NFL. I wonder if there’s any correlation in the lack of social media coverage around this in comparison to other events? Or was this more of a niche news story? Great and relevant topic to touch on for this post! I am a huge fan of Beth Mowins and the NFL so I was very aware of her accomplishment as it happened (I actually met her last week…fangirling goals!!!). As the game was happening, I was seeing firsthand the hurtful comments about her via social media. So many people have nothing nice to say and can’t just commend her for everything she’s done for women in sports. As a woman very passionate about this industry, I am proud of her performances and her talents. To me, she’s great!!! My best guess is she’ll continue to thrive and dismiss the negative comments, as she’s the one making millions on a huge stage and the trolls have nothing better to do with their lives! Awesome topic and really well written!!!! I was unaware but am not surprised by the negative reactions to Beth Mowins calling the game. I wonder how often commentators are tweeted about during the course of a normal game compared to this particular one?